March 7, 2014. Posted in Tamil Nadu. Mornings start early in Rettanai, a small agricultural village about four hours south of Chennai, Tamil Nadu. 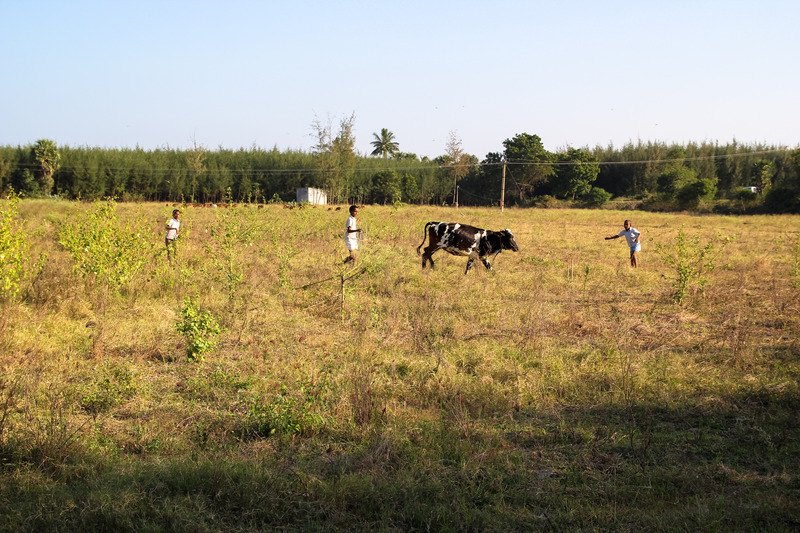 Cows begin to rustle and roosters start to crow by 4 am. “That’s the village alarm clock,” jokes a local. If the animals don’t wake you, the temples surely will. By 4:30 the main temples in and around the village are competing to see which can blare prayer music the loudest. The old speakers can hardly take it and emit a mix of crackles and garbled chants. But a quieter awakening takes place at Mohan’s tea stall. 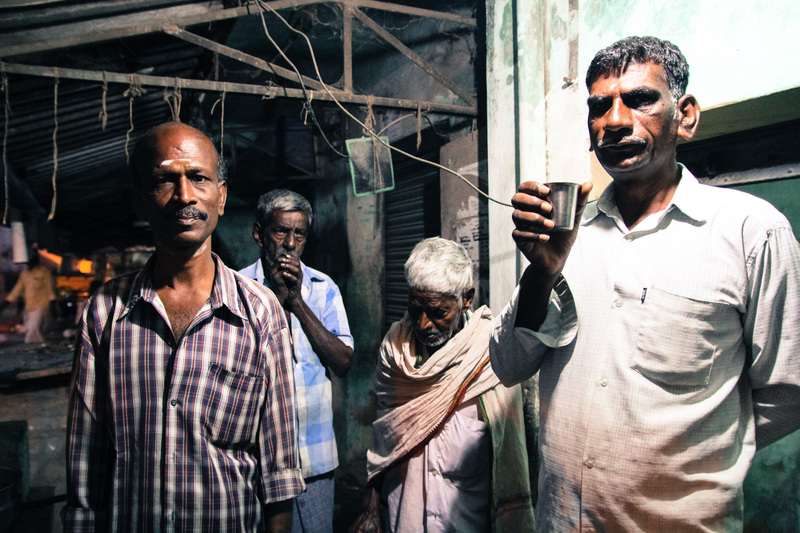 Farmers, eager to get into the fields early and finish their work before the oppressive late morning heat sets in, gather around one of Rettanai’s oldest tea shops at dawn and wake up with Mohan’s milky chai. For forty years, men (and the occasional woman) have gathered at the stall to discuss village matters, read the newspaper and prepare for the day ahead over a cup of hot tea. Mohan and his early morning customers. Mohan’s daily routine begins at 3 am when he milks his cows – “it is the first thing I do before I even brush my teeth,” he says. Mohan will go through about ten liters over the course of the day to serve his regular customers. Tags: Agriculture, Chennai, entrepreneur, Mohan, Pongal, Rettanai, Tamil Nadu, village. January 10, 2014. Posted in Tamil Nadu, Video. Travelling to new places can be exciting. But when the journey involves changing buses at a crowded terminals where all the signs are in a language you can’t read, you could use a helping hand. Fortunately in Indian bus stations, chai wallahs abound and act as de facto help desks when station workers cannot be found. We found ourselves in need of assistance at the Pollachi bus stand in the middle of a ten-hour journey. We had descended from the heavenly hills of Munnar, Kerala where we had been visiting tea gardens and cardamom farms and were en route to Kotagiri, Tamil Nadu where another tea estate awaited us. But first we had to find our bus. A constant stream of buses painted in marvelous colors poured through the station, slowing to a rolling stop as passengers packed in and conductors screamed their destination in nasal Tamil. “Coi, Coi, Coi, Coi, Coiiiii!” It seemed every bus was headed to Coimbatore, not one to Kotagiri. Looking for help and a little caffeine, we turned to one of the station’s chai wallahs, Selu Kumar, who operates a modest stall from which he sells tea, coffee, and an assortment of deep fried vadas. Having memorized the locations and timings of each bus departure, Selu Kumar pointed us in the right direction and sent us off on the next leg of our journey. 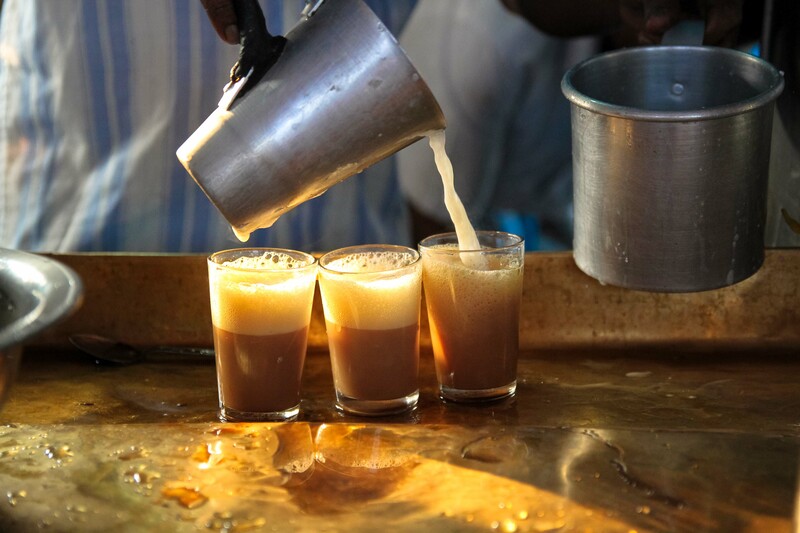 But not before he poured us a glass of chai brewed with the trademark technique found throughout Tamil Nadu’s tea kaddais: straining a stream of black tea into the glass, adding frothy milk pulled with sugar, and topping it off with one more touch of tea. With another hour to go before our bus to Kotagiri and thirsty for more chai, we decided to visit a few more of the station’s chai wallahs. Kaliappal pours a steaming cup of milk. Dhant Bani with a freshly brewed glass of strong tea. Ravi heats milk and tea in separate tumblers over a pot of boiling water. 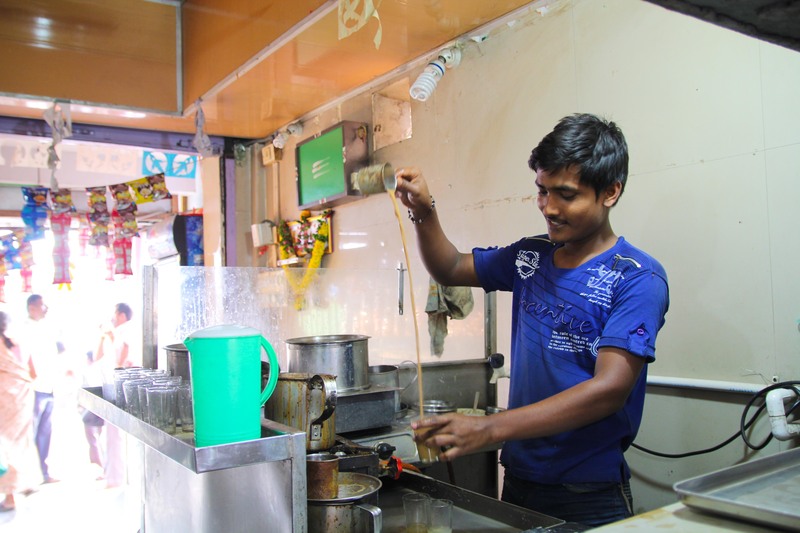 Gopalkrishna makes his chai frothy by pouring it from a height. Tags: bus, bus station, Chai, chai wallahs, coffee, Kerala, Pollachi, Tamil Nadu, vada.